Gotta love it when you get to DJ at one of your favourite clubs with some of your favourite DJ’s. And so it rather wonderfully has come to pass as Queen Josephine and I join Floorplay for their Miami After Party at Brighton Coalition on Saturday 9th April. 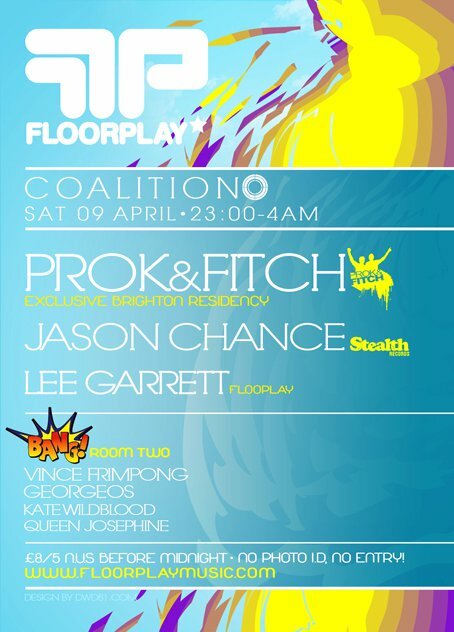 Prok & Fitch never fail to raise a grin with their fabulous big room house and they’ll be joined by label mate Jason Chance from Stealth Records as well as the ever impressive Floorplay resident Lee Garrett. Queenie and I will be trying to dance the Bang! boys Vince Frimpong and Georgeos on to the tables with some very special hands in the air house anthems. Queenie is most excited at the prospect of some well over due Bang! action with the boys – she still blushes at the thought of her and Vince’s Pussycat Club adventures – so make sure you join us for a night that we just know is gonna smash Brighton seafront!